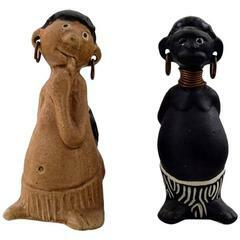 Rolf Palm, Höganäs, Indian, unique ceramics figure, Swedish design, 1950s. Measuring: 22 cm. Stamped. In perfect condition. 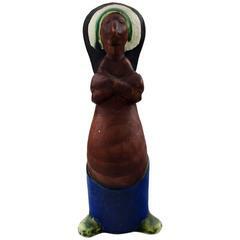 Rolf Palm, Höganäs, Indian, unique ceramics figure. Swedish design, 1950s. Measuring: 21.5 cm. Stamped. In perfect condition. 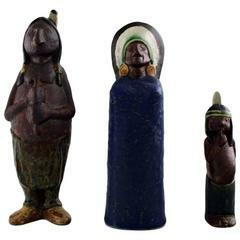 Rolf palm, Höganäs, three Indians, unique ceramic figures. Swedish design, 1950s. Measuring: 21.5 cm. (highest) Stamped. In perfect condition. 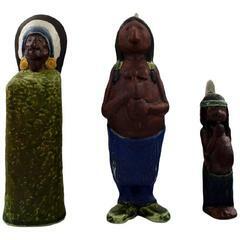 Rolf Palm, Höganäs, three Indians, unique ceramic figures. Swedish design. 1950s. Measuring: 21.5 cm. (highest) Stamped. In perfect condition. Floor vase designed by John Andersson. Handmade at Höganäs in Sweden. Made from earthenware with white semi glossy glaze. Very good condition with few signs of wear and patina. Nice tall vase made in Höganäs Sweden by designer Karl Persson made in the 1970s. Sculpture “Rain” designed by Ole Christensen, Denmark, 1950s. Stoneware. Provenance: The collection of Karin and Ole Christensen. Sculpture ‘Double Flower’ designed by Ole Christensen, Denmark, 1950s. Stoneware. Provenance: from Karin and Ole Christensen's own collection. Hand modelled and glazed ceramic. Stoneware. 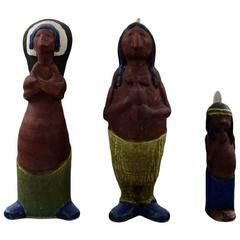 Measures: Height 22 cm/ 8 3/4" Diameter 14.5 cm/ 5 5/8".